Walmart: After years of ever-earlier sales on Thanksgiving Day, the world’s largest retailer has transformed Black Friday into a five-day event. Wal-Mart Stores Inc. announced Wednesday that sales will begin at 6 p.m. on Thanksgiving. Walmart will roll out sales in stores and online on different categories of merchandise like home goods, toys, and electronics. “This year, we're blowing it out with five days of deals in store and online,” said Duncan Mac Naughton, the company’s chief merchandising officer. Target: Target is launching its “biggest, most digital Black Friday ever” at 6 p.m. on Thanksgiving, with a range of deals over the weeks leading up to Black Friday. Target, which opened its doors last year at 8 p.m., is also offering free shipping up to Dec. 20. The biggest steal? Target is selling the Samsung Galaxy S5, regularly $200, for one whopping cent each (with a two-year contract). Best Buy: In an attempt to one-up its retail competitors, Best Buy will kick off its sales at 5 p.m. on Thanksgiving, an hour earlier than the store opened last year. (Best Buy is even handing out tickets up to two hours before the doors open.) As to be expected for an electronics giant, Best Buy’s flagship deal is a 50-inch Panasonic TV for $199.99. Macy’s: Macy's will kick off its Black Friday sales at 6 p.m. on Thanksgiving afternoon, two hours earlier than its opening time last year. The department store's big deals, which last until Nov. 30, are focused on clothes, shoes, jewelry and homewares. 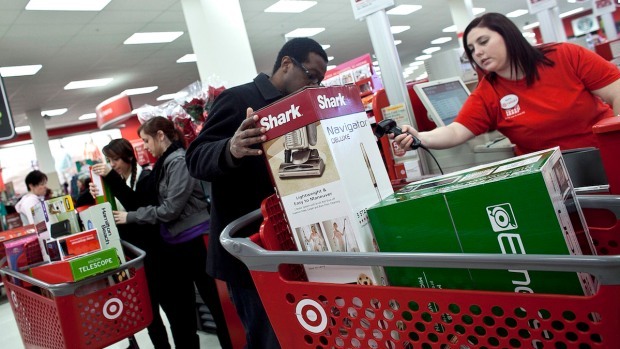 The Holdouts: Many retailers are bucking the Black-Friday-on-Thanksgiving trend. Costco, for one, is giving shoppers a chance to digest their Thanksgiving dinner, saying that its employees “deserve the opportunity to spend Thanksgiving with their families." Nordstrom, Dillard's, Barnes & Noble and GameStop are also closed on Thanksgiving, but are planning Black Friday sales.